Unico Heating & Cooling Systems are ideal applications for those who want to cool or heat their homes or buildings and have no ductwork, inadequate ductwork, or where little space for ducting is available. As a small-duct, high-velocity central heating and air conditioning system, Unico uses less than one-third of the space of a traditional system. It can deliver up to nine tons of air conditioning in the exact same space compared to a traditional three-ton unit. Air Technical Services Heating, Air Conditioning & Plumbing is proud to offer Unico Heating & Cooling Systems for homeowners and businesses throughout Ocean County, NJ. Unico Heating & Cooling Systems are considered small duct, high velocity (SDHV) air conditioner systems. Delivering conditioned air through smaller ductwork and flexible supply tubes at a higher static pressure (i.e. velocity) than conventional forced air equipment, these unique, innovative systems are perfect for residential settings such as homes or townhouses. Because of their smaller size, they are popular with homeowners, but also provide versatile solutions for most commercial applications. Whether your project is an older, historic retrofit or a high-end custom remodel, Unico Heating & Cooling Systems offer many benefits. Unico Heating & Cooling Systems go where no other HVACs go. No matter the size, age or configuration of your building, Unico Heating & Cooling systems offer comfort and efficiency, without compromising the integrity or aesthetics of your home. They discreetly fit in homes where conventional heating and cooling systems don’t, requiring little to no remodeling. Their flexible small ducts are designed to be routed through existing ceilings, floors and wall cavities. These easy-to-install modular air handlers and coils are small enough to fit in closets, crawl spaces, attics or ceilings, yet powerful enough to circulate air throughout your home. Perfect for historic homes, Unico Heating & Cooling systems can adapt to fit your existing spaces, so you can preserve your distinctive ceilings, wallpaper, and other historic old home features. Delivering quiet and efficient air, Unico Heating & Cooling Systems feature whisper quiet home comfort. With its special sound-absorbing supply tubing that minimizes sounds and air handlers that isolate vibrations and noise, you won’t notice the Unico system is even running. Unico Systems also deliver more comfortable, drier air by design. By removing up to 30% more humidity than conventional HVAC systems, residential and commercial property owners are able to keep their thermostat a few degrees higher, thus saving on energy costs. As a high-efficiency cooling and heating system, Unico delivers draft-free and even temperatures. While traditional systems tend to distribute uneven air, resulting in uneven temperatures, Unico Heating & Cooling Systems create a gentle suction around itself using aspiration technology. 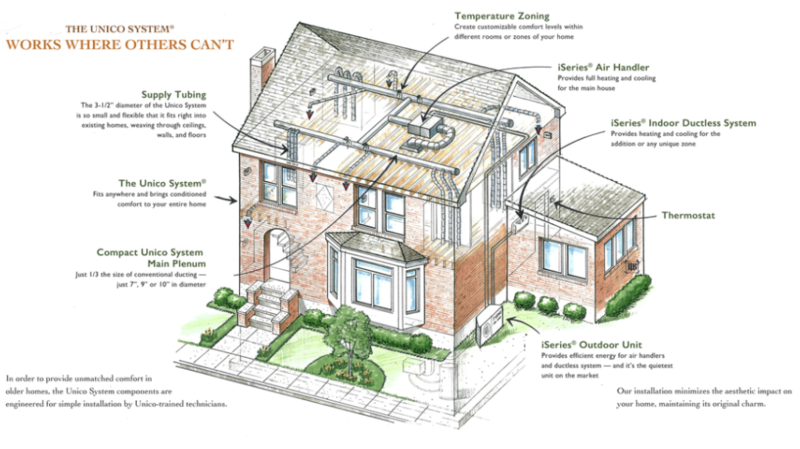 This process draws air from the room into its own stream of air, creating a temperature differential no more than two degrees throughout the home. Serving residents and businesses throughout the Ocean County area since 1999, Air Tech is a locally-owned and operated air conditioning repair, maintenance and installation company. We take great pride in the quality of our products and services and are proud to be a preferred contractor of Unico Heating & Cooling Systems. 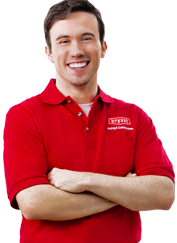 Whether you need repair, maintenance or installation, we deliver the best HVAC service around.